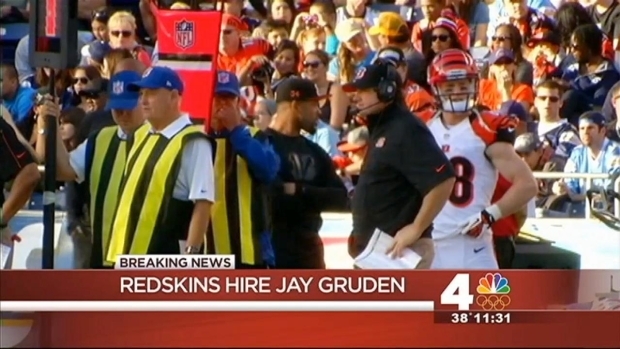 Cincinnati Bengals offensive coordinator Jay Gruden will become the next head coach of the Washington Redskins, News4's Dianna Russini has confirmed. The team will hold a 4 p.m. press conference Thursday to formally introduce him. Gruden, 46, was one of the NFL's hottest coaching candidates, interviewing with the Redskins on Wednesday. He has connections with the Redskins; he worked under general manager Bruce Allen with the Tampa Bay Buccaneers and with defensive coordinator Jim Haslett in the UFL. His new contract is reportedly for five years. Gruden will become the Redskins' eighth head coach under Daniel Snyder's ownership (none have lasted more than four years or have earned a winning record in their first seasons), and comes 11 days after the team fired Mike Shanahan. 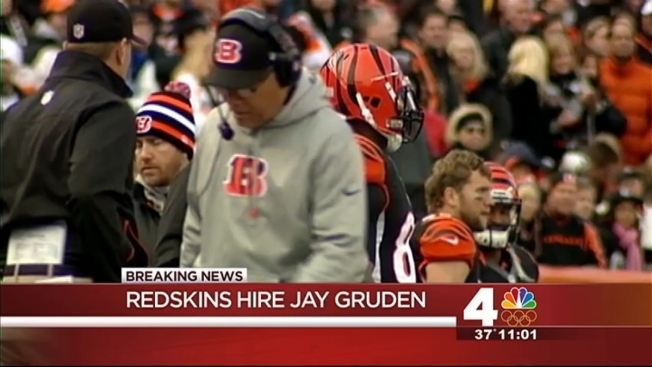 Washington-area fans react to the hiring of Jay Gruden as the new head coach of the Washington Redskins. Gruden, 46, was one of the NFL's hottest coaching candidates, interviewing with the Redskins on Wednesday. He has connections with the Redskins; he worked under general manager Bruce Allen with the Tampa Bay Buccaneers and with Haslett in the UFL.. His new contract is reportedly for five years. Shanahan compiled a 24-40 record during his four-year tenure in Washington. Except for a spirited run to the NFC East title in 2012 that saw the Redskins win their final seven games, that tenure was an unmitigated failure. Entering this season with heightened expectations, the Redskins fell apart, losing eight straight games for the first time since 1961 to finish the season at 3-13, their worst record since 1994. Throughout 2013, Shanahan was on the defensive, beginning with his decision to keep Robert Griffin III in the NFC Wild Card game against the Seattle Seahawks despite the franchise quarterback being visibly injured. Growing heat from fans and the press warmed Shanahan's seat to unimaginable levels as several reports surfaced regarding his contempt for how owner Daniel Snyder apparently runs the organization. Back to Gruden: In his three seasons with the Bengals, the team's offense improved from 18th in 2011 to 6th in 2013 in points per game. This season, Cincinnati, which lost in the AFC Wild Card Round to the San Diego Chargers last week, had the 10th-ranked offense in the NFL in total yards. Redskins fans weigh in on who should coach the team, which players should stay and what next season will bring. Pat Collins reports. There are conflicting reports regarding the status of Haslett, who Washington retained after cleaning out most of former coach Mike Shanahan's regime. ESPN is reporting that defensive backs coach Raheem Morris will be promoted to defensive coordinator, while CBS and The Washington Post are reporting that Haslett will remain in that position. Job was Gruden's to lose from the start, keeping some of staff saves Skins $, Allen always knew who he wanted! More to come as more details become available. Skins GM: "This Is a Painful Day Befitting a Painful Season"